THREE RIVERS, Calif. — The magic of John Muir lives today in our public parklands and wilderness areas, and in writings and teachings about nature and our place in it. John Muir was a writer, naturalist and conservationist who helped preserve America’s natural environment. He was born April 21, 1838, in Dunbar, Scotland, the eldest son of a Calvinist shopkeeper father. When John was 11, the family immigrated to the United States, to homestead near Portage, Wis. Though his days were consumed with farm work, he was an avid reader. By his mid-20s, Muir seemed to have a career as an inventor ahead of him. John Muir immerses himself in nature at Kings Canyon (Photo courtesy of National Park Service). During the late 1800s, Muir traveled America’s wilderness, especially in the Sierra Nevada of California. Muir was one of the nation’s most eminent nature writers, a father of our national parks, and a keen advocate for keeping unmanaged nature alive. The impact of his articles in Century magazine in the late 1880s drew attention to the destruction of forestland by grazing animals, and eventually led to the creation of Sequoia and Yosemite national parks in 1890. Muir recognized the importance of establishing an organization that could serve as a sounding board for his ideas. He wanted to develop environmental leaders that could build with its numbers a political force of its own. In 1892, he founded the Sierra Club, a prominent American conservation organization. His passionate writings sparked America’s first conservation movement, earning him fans such as President Theodore Roosevelt, who accompanied him in 1903 to California’s Yosemite Valley. Muir camped with President Roosevelt in a remote spot in Yosemite. They rode down the trail past Vernal and Nevada Falls to the Valley, and then rejoined Roosevelt’s group the next day. Historians speculate that that evening gave Muir just the opportunity he needed to persuade Roosevelt to establish the U.S. Forest Service, which the President did two years later. Through his inspirational writing and the sheer power of his advocacy, John Muir made a big difference in motivating a nation and its leaders to conserve the natural world. “Muir studied glaciers, alpine plants and forests, particularly in the Sierra Nevada,” said UCLA geographer Glen MacDonald. “He was really interested in conservation of nature and striking a balance between human activity and conservation. 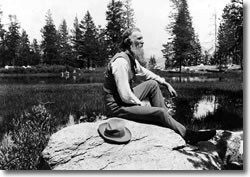 Millions have read his letters, essays, and books telling of his adventures in nature, especially in the Sierra Nevada Mountain Range of California. His activism helped to preserve the Yosemite Valley, Sequoia National Park and other wilderness areas. “He was a writer, scientist and even a mapmaker. So even though he wasn’t officially a geographer, in his work he did many of the things that you find being done today in a geography department,” MacDonald said. Muir became known for articles that praised the natural world, speaking in poetic, spiritual terms about his affection for the ecology and humanity’s earth connection, garnering a large and varied readership. He also published a grouping of essays pushing for the establishment of Yosemite National Park, which was created in 1890. Muir became a major figure in the creation of parks in other regions as well, such as the Grand Canyon. Muir was a painter in a sense, not with a brush or oil, but with his words. He opened people’s eyes to a landscape that he knew did not exist in places like his native Scotland. It was all about preservation. “It often took an immigrant coming into the country to see what Americans had that was special and needed to be cherished and preserved. 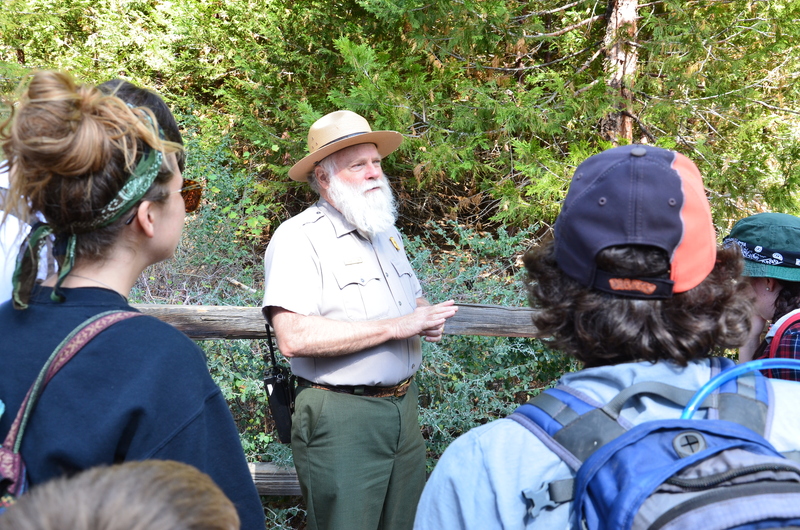 Muir opened people’s eyes and helped them see the depth and beauty of these places,” said Park Ranger Frank Helling, a John Muir re-enactor. Sequoia National Park Ranger Frank Helling leads a tour. Muir and his environmental message continue to thrive due to the artistry of actor Lee Stetson who has been portraying the famous naturalist in Yosemite and throughout the U.S. since 1983. Carl Zichella, regional director of the Sierra Club, reflected on how the commanding words of John Muir and the monumental imagery of the Sierra Nevada changed his perspective and life. He also examined the ongoing significance of these icons, Muir and the Sierra Nevada, and on our national and international perception of environmental protection and respect for wilderness. John Muir died from pneumonia at age 76 on Dec. 24, 1914, in Los Angeles. His legacy lives on in his writings and the wilderness he helped preserve. “Studies in the Sierra,” 1874. “The Mountains of California,” New York: Century, 1894. “Our National Parks,” Boston: Houghton Mifflin, 1901. “My First Summer in the Sierra,” Boston: Houghton Mifflin, 1911. “The Yosemite,” New York: Century, 1912. “Travels in Alaska,” Boston: Houghton Mifflin, 1915. “Steep Trails,” Boston: Houghton, 1918.